The Shimano Altus line is Shimano's budget friendly mountain groupset, bringing time-tested Shimano quality to the entry-level cyclist. The Altus M311 Crankset is an excellent replacement crank for entry-level bikes and includes a built in chainguard to keep pants and shoelaces out of the drivetrain and grease and grime off of your clothing. Simple - Ordered it and it came quickly without fuss. Used as a replacement crankset on a 20 year old Trek. Worked perfectly! Packaging was excellent! Got this to replace the crank on my buddies cheap bike. Great price for twice the crankset! 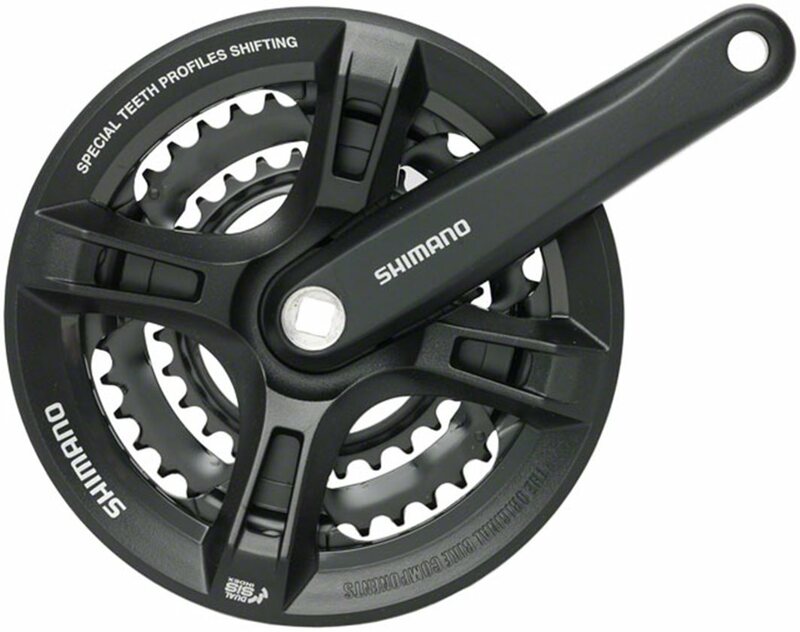 Shimano produces quality products even at the entry level. It’s was exactly what I needed to replace my factory crankset. what's tooth count per chain ring? Does this crankset come with the left side pedal arm ??? Yes, it does come with both pedal arms. does this fit an 18 speed bike, with a 6 speed cassette? BEST ANSWER: I am using it with an eight speed cluster. The problem I have is shifting to the smallest sprocket, but that's mostly the configuration of my system. I think this chain wheel would work well with a six speed , with no problems. As this is the front sprocket it doesn’t matter what cassette you have on the back. Your chain is a little wider but that doesn’t matter. I have this on my custom built 30 speed, with a 10 sprocket rear cassette. I am sure it will fit 6,7,8,speed with no problems. Is it compatible with 10 speed chain? BEST ANSWER: You want an 8 speed chain for Altus. No. The Altus M311 is 8 spd. you should use that speed chain. The 10 spd chain is thinner and may work but shifting quality may be hindered.